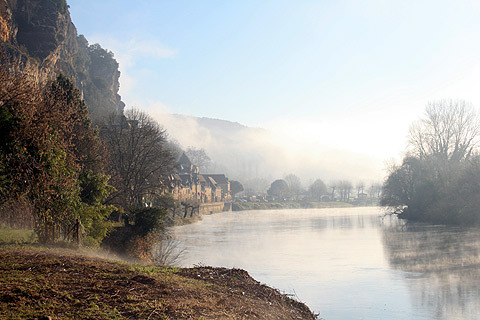 The Dordogne is a stunningly beautiful part of France and its woods and valleys are criss-crossed with hundreds of walks. The whole Dordogne region is suitable for walking - away from the main routes even the roads are quiet enough to walk all year around. I have not detailed individual walks because these depend on where you are and how challenging you want a walk to be and it is impractical to list hundreds of walks, however attractive they might be! A good book of walks for the dordogne area is 'Walking in the Dordogne by Cicerone'. Otherwise if you want to do some walking the best place to start is the local tourist office. All towns in the Dordogne area will have a tourist office with lots of information about local walks and walking, with difficulties to suit all ages and abilities - you are advised to visit early on in your visit so that when the weather is right you are ready to set off - early morning and early evening are usually the best times for walking, both for the light conditions and for the temperatures. Whilst the information you are given is often in French each guide comes with a map and will tell you what colour 'balisage' you will be following. The balisage are marks made on signs, trees, lamp-posts etc which help to guide you when you are on the walk. For example if your walk is signed in yellow you will need to look out for yellow lines on trees etc. A yellow cross means this is not the direction to take and there must be a turn just before this. A turn is signalled by a sign a bit like this '-l' . If you are following a yellow walk ignore any signs in blue, red etc as these are other walks which cross the one you are doing. On the whole the signs on the walks are reasonably clear and the walks are well maintained, however I walk with a local group and we do get lost from time to time! Some particular favourites are walks near the Chateau du Hautefort , a walk near the Chateau of Les Milandes and walks in the Gorges de la Vezere. As well as walking, both canoeing and cycling in the Dordogne are great fun.